Home renovation can get people’s mind into the state of despaired. In this couple’s case, they destroyed the house altogether and become homeless. The husband landed in jail. Be careful with renovation, if you can’t handle the stress, just hire professionals. While I was finishing my detach garage, nails were flying everywhere. Worker would cut corner here and there. It was very stressful. 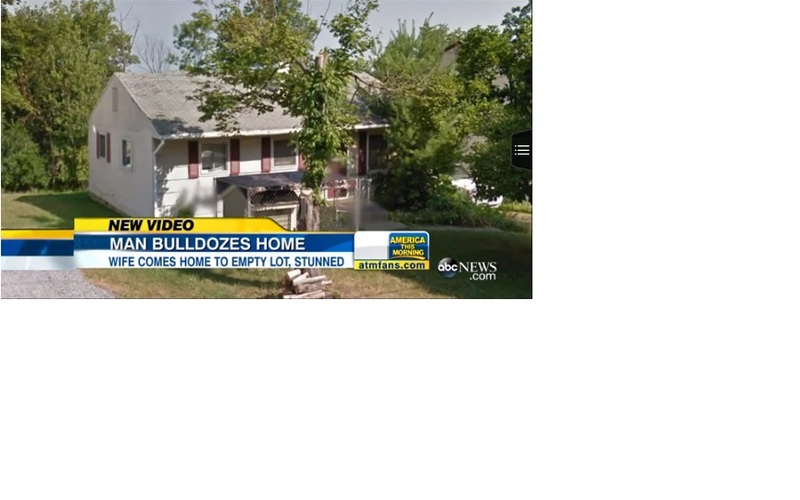 I can see why the wife was making joke prior to leaving the house asking “are you going to bulldozer the house” and he said “yeah”. 1. Often, people see there is a problem, they either choose to take care of it until it’s not a problem anymore. This is my style, when there is an issue, I’ll beat it to death. Until, it’s gone, done, thorough job. 2. The other kind, is they let it slide, buried it, but the problem always there. When I work with these people, I do not like it at all. Ewww! 3. One more is the gone-postal, nuclear kind, they always very quiet, very mild, but they rarely explode, but when they do, they just destroy things, because they don’t have a proper outlet. There was a study, saying people who gossip outlive the non-gossip, because the gossiper seems to have a better socialize. At work or at home, companies often overlook these kind of employees or spouse. In this woman’s case, she didn’t even know the husband was completely lost all of his patience, she said they haven’t been fighting. I’d assume that he’s a nice gentle man who would take all the punch that people would throw at him. Know when to walk away for a little bit – walking away doesn’t mean giving up! Now, I was lucky when I did my renovation, Mr. WRI saw me stressed out, and when we ran into issues with building and was waiting for the next stage to pass, he’d suggested we take short hiking trip and to the beach. Relaxed a little, making the waiting period go shorter. It did! I also admit the winter seems to come earlier this year, but looking back, I was robbed of my summer and fall because I was too focus on renovation and business. This is one of the point I’m learning. Home renovation was so “bad” that when an opportunity came up to buy a water front property in the city, I made a terrible mistake when I bid, and loss it. It’d be a great house to live in. I also need to learn to do the comps right. Learn to trust my instinct. Live and learn, no blaming game! Now I can’t blame Mr. WRI for swaying me away from more property obtaining. He’s worried that I’m playing monopoly with real money and greed would get the best of me. I read the blog of the guy buyfourmore.com, this guy wanted 100 properties, I don’t want that many, but when I see a great deal or a great opportunity to improve my cash flow or live in a dream location home, why not? This is what any adult will have to go through, to jump or not to jump? !